This part of America’s history is extremely important, but it’s mostly ignored by the school textbooks. My grandfather was one of the miners who went on strike in 1913, and my father was named after Louis Tikas. 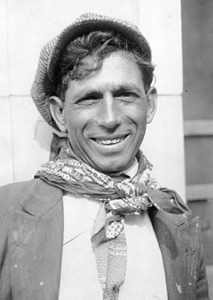 After Louis was murdered, his successor was an immigrant miner named Pete Katsulis. My grandparents’ second son was named Pete after him. Here’s what I’m writing to say: the photo on the web page is not Louis Tikas. It’s Pete Katsulis. I’ll be glad to send you a portrait of Louis. Just let me know. Sorry, but for some reason I wasn’t notified of your comment until now. Yes, please, if you have a photo of Louis Tikas, send it along. Thanks for the correction! In my earlier comment I forgot to say that Palikari: Louis Tikas and the Ludlow Massacre is a GREAT documentary. I have seen it, and I encourage all to watch it.